Choose where to stay in Brussels from the city’s varied neighborhoods. Use this guide to find the right Brussels hotel to suit you. All roads in Brussels’ medieval city centre lead to the mighty Grand’Place, recalling centuries past with its step-gabled guild houses and ornate Town Hall. Lanes fanning out from the square hide shops, restaurants, cafés and the much-photographed Mannekin Pis statue. Further east is Brussels Central, a major railway and metro station, and the Gothic Cathedral of St Michel and St Gudule. Edge north-west for great-value seafood restaurants on buzzy Place Saint Catherine and Belgian fashion on boutique-lined Rue Antoine Dansaert. Or head south for the weekend antiques market on elegant Place du Grand Sablon and world-class collections at the Royal Museums of Fine Arts. South of the city centre, fashionable Ixelles is the shopper’s choice of where to stay in Brussels. The main artery, Avenue Louise, is a catwalk to big-name designers. By night the vibe is upbeat in the district’s slick lounge bars, gourmet restaurants and live music venues. Follow Avenue Louise south to Bois de la Cambre’s serene forests, lakes and Cistercian abbey. West of Ixelles, the arty Saint-Gilles neighborhood is punctuated by graceful townhouses and is home to the Art Nouveau Horta Museum. Glass and steel skyscrapers crowd the horizon in the 21st- century European Quarter, where the city’s policymakers convene behind the gleaming façades of the European Union Commission and EU Council. Trône and Schuman metro stations serve the neighborhood, which lies east of the city centre and is home to some of Brussels’ smartest hotels. The Brussels Park, overshadowed by the stately Royal Palace, lies to the west. Bordering the district to the east is Cinquantenaire Park, where a triumphal arch looms above flower-strewn lawns. Here you’ll find the Royal Military Museum and the motor-mad AutoWorld Museum. North-east of central Brussels is low-key Saint-Josse-ten-Noode, home to a thriving Turkish community and restaurants dishing up global flavours from kebabs to curries. The relaxed neighborhood is close to Brussels Nord train station, with direct connections to Brussels Airport. Set in lush gardens, Art Nouveau greenhouse Le Botanique stages cutting-edge exhibitions, plays and concerts. Further south, the Congress Column looms above Place du Congrès, and the Belgian Comic Strip Centre amuses crowds with Tintin adventures. 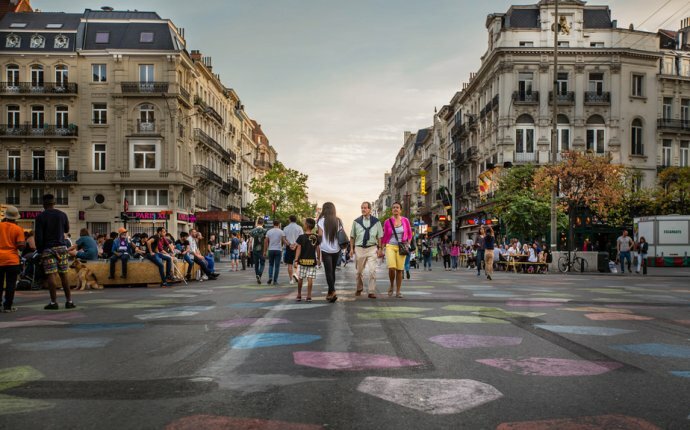 South-west of the centre, laid-back Anderlecht is scattered with family-run B&Bs and Brussels hotels, conveniently located for major transport hub Brussels Midi. The big draw for lambic beer lovers is the Cantillon Brewery, giving insight into the brewing process. Step west to the little-known redbrick Erasmus House, once home to the great scholar, which showcases Albrecht Dürer prints and Erasmus’ early manuscripts. Continue west for quiet strolls or a round of golf in Parc de la Pede.